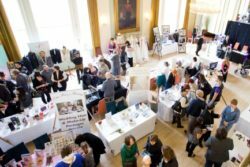 The Marin Wedding Fair brings engaged couples and the best of San Francisco Bay Area Wedding Industry Professionals under one roof to help couples tie up loose ends before tying the knot. There will have complimentary bites, libations and day of show promotions/giveaways you wont want to miss. The local vendors look forward to meeting you and making your dream wedding come to life. Free admission and parking.